Socializing with other users has been a trend for past few years and it is definitely not going away. Having a public chat feature where users can communicate within a group or among their friends is a great add-on to many applications. Today, we will create a realtime Group Chat Application using Laravel and Pusher. With the release of Echo, Laravel has provided an out of the box solution for implementing a realtime chat application using event broadcasting. It is quite simple to get started in a matter of few minutes. We will implement a feature where multiple users can chat with each other in a single chat box. The code is available on a Github repository for cloning and understanding purposes. Before a user can start chatting with their friends, they need to create a group and add users to it. Whenever a new group is created, the users in the group should get the chat popup in realtime. As we are listening on a private channel, we need to authenticate that the currently logged in user is able to listen on this private channel. Laravel Echo will automatically call the necessary authorization routes if we are listening to a private channel. But, we need to write the authentication logic which will actually authorize the user. Installation and configuration of Laravel Echo is a must before we can start listening to new events. We have covered the process in detail in the above section of this article. Please go through it if you might have skipped it. Now, whenever a new group is created, it is broadcast over Pusher only to the specific group members. Next, we listen to the private channel and push the new groups to our group’s array in our Vue component. Once a user has access to the group, they can communicate with the other users in the same group by exchanging messages in a single chat window. Next, we will record each message entry into the database. Below is the demonstration of our whole functionality of creating new groups and chatting with the members. 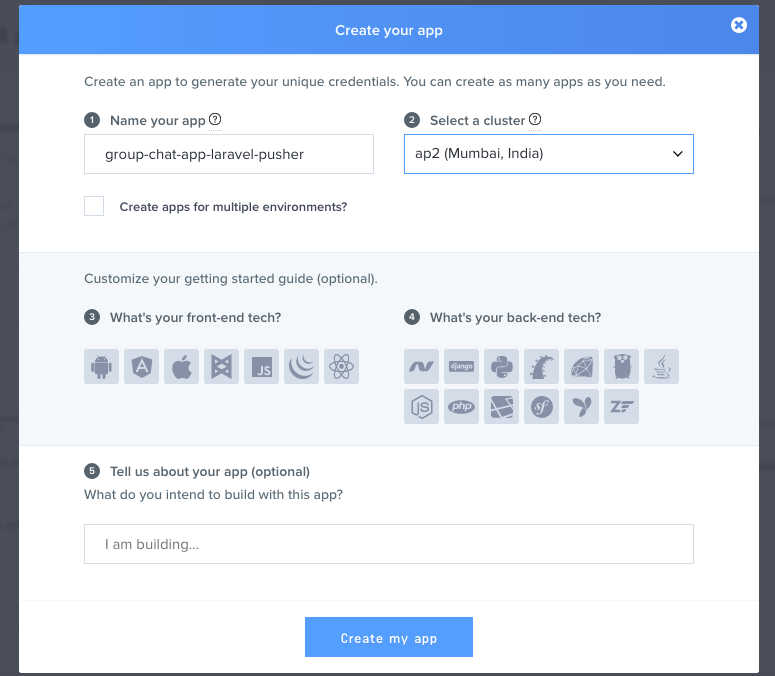 In this article, we have demonstrated how to create a group chat application. We have covered the configuration options necessary to get started, and the examples above should help you fill in the gaps and give an overview of some of the other configuration options available to you. The code is hosted on a public Github repository. You can download it for educational purposes. How do you use Laravel and Pusher for chat applications? Can you think of any advanced use cases for this library? What are they? Let us know in the comments!